During installation, programs create some temporary data on the computer drive, which is not deleted by default. As we keep on using these programs, more temporary files are created. Sometimes this temporary data is helpful for the user, like browser cache, but most of the times it’s just junk. You’d think that uninstalling these programs would also delete all of the files that they created, right? Well, that’s what the logic says, but in reality it doesn’t work this way. When we uninstall a program, its associated files and folders, settings, and shortcuts are not always deleted. The computer cleaners and optimizers try to keep computers junk-free and optimized for performance. 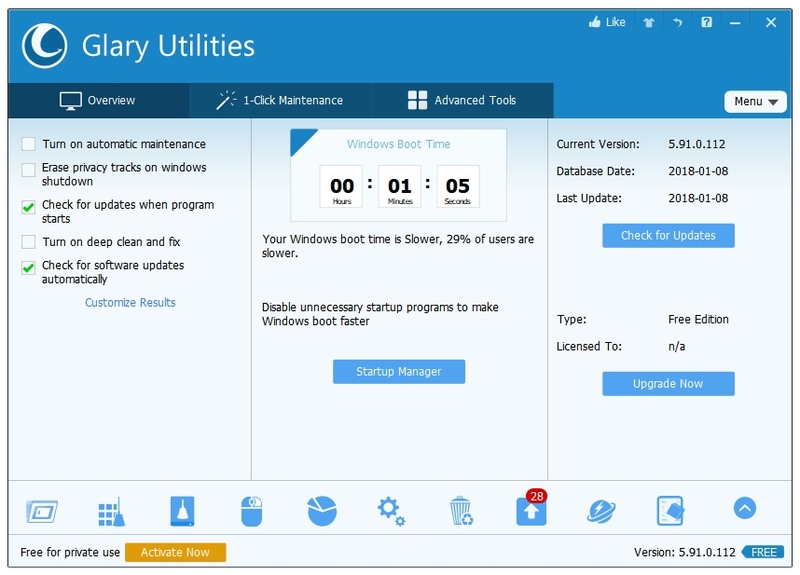 Here are some of the best free Windows System Optimizer Software. CCleaner is Disk Cleanup on steroids. It’s the most popular and the most trusted Windows Disk and Registry Cleaner and Optimizer. The left sidebar of CCleaner has links to all of its options – Cleaner, Registry, Tools, Options and Upgrade. The first item on the sidebar is the Cleaner, which is the main function of CCleaner. Cleaner is divided into two categories – the first one titled Windows includes all of the programs by Microsoft, and the second one titled Applications includes programs by other companies or developers. Various options are available for the user to clean under both of these categories. The default settings by CCleaner are pretty safe and optimal. The second item on the sidebar is Registry. Clicking the Scan for Issues button starts scanning Windows for the Registry related issues. Once it has finished scanning, the Fix selected issues button becomes clickable for you to fix the Registry related issues. The third option is titled Tools, which has links to various additional tools provided by CCleaner such as Uninstall, Startup, Browser Plugins, Disk Analyzer, Duplicate Finder, System Restore, and Drive Wiper. The fourth button titled Options takes you to the CCleaner options window. You may want to adjust its settings according your preferences. 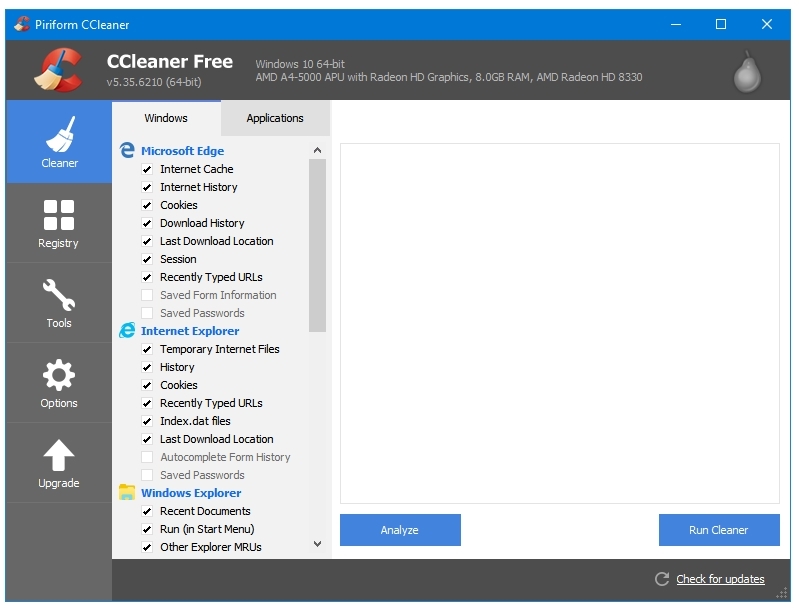 The free version gives you access to Settings, Cookies, files and folders that you want CCleaner to Include or Exclude, and some Advanced options. WiseCleaner team makes some great freeware. 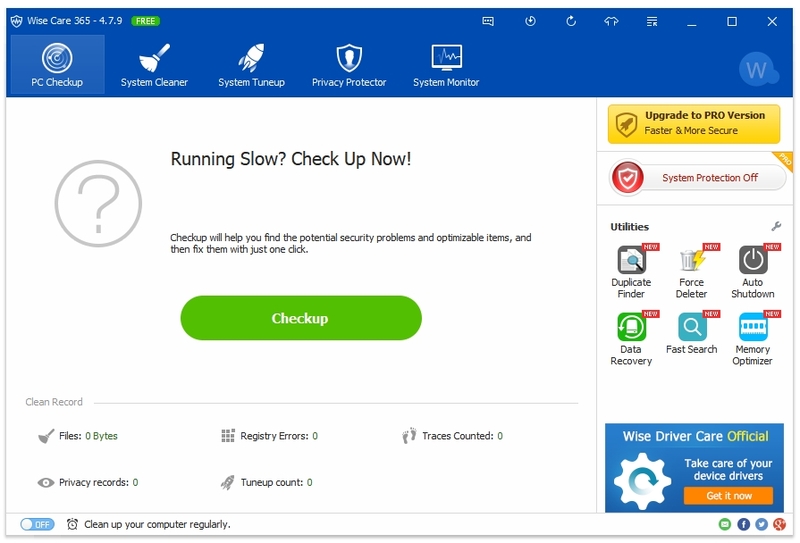 The Wise Care 365 Free has divided all of its functions in nicely laid out 5 sections – PC Checkup, System Cleaner, System Tuneup, Privacy Protector, and System Monitor. The PC Checkup function acts as the home screen of the program. You can check your PC for junk files, registry errors, program traces, privacy records, and other tuneup issues with this feature. This process can be automated as well. The home screen has links to other utilities like Duplicate Finder, Force Deleter, Auto Shutdown, Data Recovery, Fast Search, and Memory Optimizer. 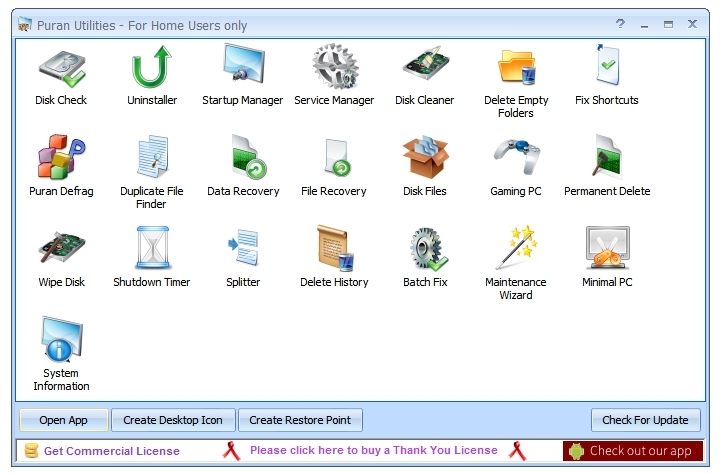 The System Cleaner buttons takes us to window that has all the main system cleaning options such as Registry Cleaner, Common Cleaner, Advanced Cleaner, and System Slimming. The Registry Cleaner scan and cleans Windows Registry, Common Cleaner is Wise’s Disk Cleaner, Advanced Cleaner is a custom cleaner feature, with this feature you can specify your cleaning location as well as file extensions. For example, if you only want to delete the .tmp files then you can select that file extension here, and then only the .tmp will be detected and deleted. System Slimming scans for the large temporary Windows files that are using your drive space such as the old Windows Installation Files, etc. The System Tuneup section includes all of the optimizations tools. WiseCleaner provides System Optimizer, Disk Defrag, Registry Defrag, and Startup Manager features in their free version. The Privacy Protector mainly deals with the History files and other files that can be recovered from the system, which can be a privacy issue for some. This sections includes Disk Eraser, File Shredder, and Password Generator. The last section is the System Monitor, which has two features – Process Monitor and Hardware Overview. PrivaZer is freeware application available as an installer as well as a portable. It does not have a paid version but a Donors version. Some of the options of PrivaZer are available only in their Donors version. When you open the program for the first time, you are presented with three options – Adjust PrivaZer to your needs, Go to main menu, and Use this file to setup PrivaZer. The Adjust PrivaZer to your needs gives you a comprehensive tour of the program’s cleaning capabilities while setting it up on your computer. Selecting this option takes you the next window that lets you select your user level – Basic user or Expert user. You can select Basic user if you do not consider yourself to be a computer expect. Select the Expert user option if you know your way around computers. Next, this program takes you through all of its cleaning options using 12 or 14 windows in Basic or Expert user mode respectively in a step-by-step manner. Selecting Go to main menu takes you directly to the main window of the program. The Use this file to setup PrivaZer option lets you browse for a previously created PrivaZer .ini configuration file to setup PrivaZer. The intuitive approach of this program can also be seen from the way it scans and your system. It displays the hard disk sectors and files being scanned in innovative manner using two types of visualizations. You get two safety related options on the scan window – Create a restore point, and Save registry. PrivaZer is focussed on the philosophy of Privacy. You get all kind of cleaning and privacy related features in this program. Glary Utilities is the true replacement of CCleaner, the amount of features and utilities that it has makes it a complete optimization suite. Even if you are using CCleaner for your main computer cleaning needs, you can keep Glary for all the additional tools that it provides. Glary has divided all of its tools in five sections – Clean Up & Repair, Optimize & Improve, Privacy & Security, Files & Folders, and System Tools. Clean Up & Repair has Disk Cleanup, Registry Repair, Shortcuts Fixer, Duplicate Files Finder, Empty Folders Finder, Context Menu Manager, and Uninstall Manager. Optimize & Improve has Startup Manager, Disk Defrag, Memory Optimizer, Registry Defrag, Check Disk, Driver Manager, and Software Update. Privacy & Security includes Tracks Eraser, File Shredder, File Undelete, File Encrypter, Browser Assistant, and Process Manager. Files & Folders includes Disk Space Analyzer, File Splitter, and Quick Search. System Tools includes System Information, Registry Backup, Registry Restore, Repair System Files, System Backup, System Restore, and Undo Changes. Glary Utilities includes Software Update checker and Glary Utilities Portable Maker tool as well. The Puran Utilities suite has complete set of cleaning and optimization utilities. This program is heavy in tools but light on resources. 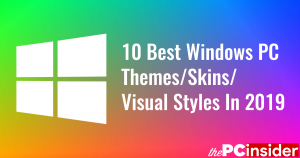 All of these included utilities are available in standalone executable (.exe) files as well. So if you don’t want to install the complete suite then you can grab the components that you like from the official website. The list of utilities include Disk Cleaner, Registry Cleaner, Disk Defrag, Registry Defrag, Data Recovery, File Recovery, Disk Check, Disk Files, Wipe Disk, Permanent Delete, Startup Manager, Service Manager, Uninstaller, Duplicate File Finder, Delete Empty Folder, Fix Shortcuts, Batch Fix, Delete History, Shutdown Time, Splitter, Gaming PC, Minimal PC, and Maintenance Wizard. A very thought-out collection of tools for complete cleaning and optimization.